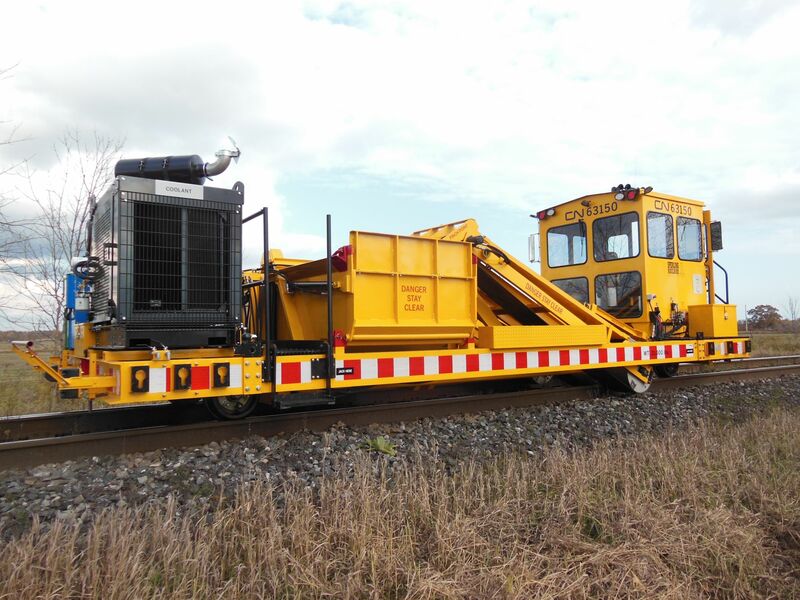 The OTMR-2 is a 4 belt scrap pick up machine used to pick up OTM (spikes, anchors, and clips) in a production tie or rail gang where both rails are in place. This machine utilizes 4 conveyors with permanent magnet pick up drums that feed into an 85 cu.ft. hopper which can be dumped on either side of the track. This machine has an enclosed and conditioned cab where most operator functions can be performed, including dumping the hopper and adjusting the height of the conveyors. Hydraulically controlled hopper chutes allow the operator to evenly load the hopper to ensure maximum capacity. An optional rear center conveyor is available for use when the operator may want to walk behind the machine to pick up any scrap that the conveyors may have missed.